From soft and slow to fun and fast, these soundtracks on a Micro sound card for iCalmCat provide a high- frequency diet, adjusted to a cat’s ability to hear three times higher than humans. Each sequence is timed for 10-minute play sessions with Kitty’s favorite 2-legged friend, hopefully that be you. Here, at iCalmPet.com, we are known as calming experts. However, everybody’s got to kick up their heels sometimes, include you and Kitty. 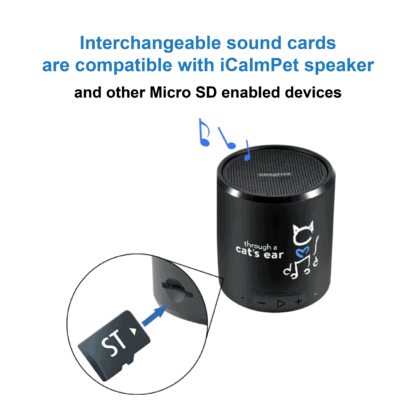 The one hour of lively, fun music on the Micro sound card Stimulation provides sensory enrichment for indoor cats. Without high sensorial activities, your indoor cat’s nervous system becomes chronically stressed. This leads to difficult behaviors and/or illnesses that impact the entire cat household. Indoor cats are mostly secluded from their innate and vital activity– hunting! Consequently, they ironically fall prey to a slow and debilitating energy starvation resulting from this lack of sensory stimulation. Essentially, this deficit causes the feline nervous system to back up and backfire. Conversely, your indoor kitty’s feral cousins are always busy. Within a large territory, free-ranging cats are naturally curious, always exploring and hunting for food. Interaction with other cats is common, and ferals are always on the lookout for dogs! 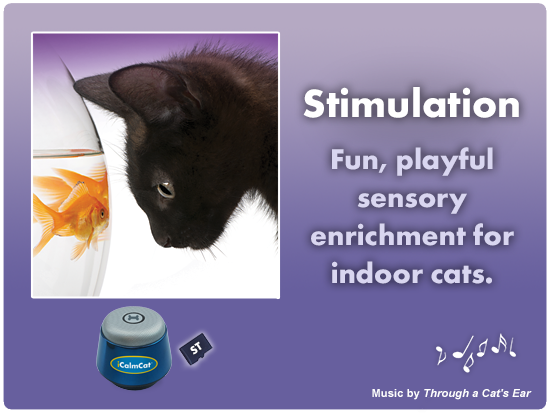 Stimulation is designed to help your cat be busy, and chances are, you will be, too! Why is environmental enrichment important? Outdoor cats are active. Indoor cats, however, usually have little to do, and passivity sets in. Sensory environments are known to shape nervous system organization from kitten age up to late-teens. In response to the desire for healthy and strong house cats, research of sensory stimulation to replace external input ramped up in the early 1990s. All signs since point to the importance of environmental enrichment to preserve optimal physical and mental feline health. As per The American Association of Feline Practitioners, “Many behavioral and physical disorders that are seen in cats are often secondary to stress from lack of appropriate stimulation.” These stress-induced illnesses and conditions include: obesity, aggression, compulsive disorders, and urinary tract or upper respiratory infections. These behaviors and conditions often lead to abandonment or euthanasia. This is not what cat owners want. So, what to do? Environmental enrichment is the stimulation of the brain by physical and social surroundings. With indoor cats, enrichment strategies include animate interaction with other cats, dogs, and people, as well as the inanimate use of toys, physical space (high structures, textures, places to hide), and sensory input (eyes, ears, nose, taste).